File Photo The Galion Historical Society car show is Sunday from noon to 5 p.m. across the street from the historical society. 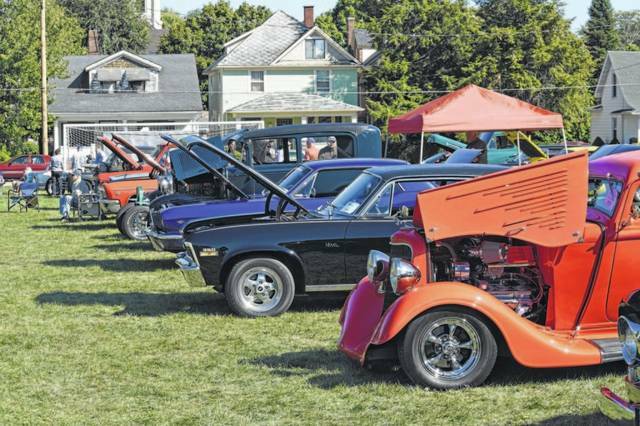 GALION — The Galion Historical Society’s 10th Car Show is Sunday Sept. 23. It is at 220 W. Walnut St., the former location of Galion Middle School across the street from Brownella Cottage. It runs from noon to 5 p.m. There is a $10 entry fee per vehicle which goes to support the Galion Historical Society. The event is open to vehicles of all makes, models, and years. Vehicle registration begins at 12 noon. Dash plaques will be given to the first 100 vehicles to register. All entries will be entered to will a door prize including car maintenance supplies from local businesses Advanced Auto Parts, Keller NAPA Auto Parts, Bell Stores, and Ralphie’s. Twenty-five awards will be handed out in various categories. Awards have been generously provided by Huntsman Trucking, Horizon Animal Hospital, Linda Hoover, Schneider-Gompf Funeral Home, A-1 Printing, Fox Plumbing and Heating, Toni’s Flowers, Quay’s Drugs, and State Farm Insurance. A 50/50 drawing will be open to anyone in attendance. Concessions will be available on site provided by B&B Concessions, and Crawford Antique Farm Machinery Association will have their ice cream truck on site. Brownella Cottage will be open for tours on the hour from 1 to 3 p.m.. Tours are $5 per adult and $3 per child. The Galion History Museum located in the Brownella Carriage house will also be open to the public free of charge. “After ten years, this event is still a great fundraiser for us,” said Tanesha Pickering from the Galion Historical Society. Pickering was also quick to point out future events currently being planned for Brownella Cottage and the Historical Society. “We have upcoming tour events in October at Brownella Cottage, and planning is underway for our annual Holiday Open House,” noted Pickering. https://www.galioninquirer.com/wp-content/uploads/sites/38/2018/09/web1_facebook-092516j-Galion-car-show_0043-1024×682.jpgFile Photo The Galion Historical Society car show is Sunday from noon to 5 p.m. across the street from the historical society.